This 3-piece contemporary accent table set with a rectangular coffee table and two square end tables, each with a framed tray top, add modern flair and storage to your living room. The unique style of the tray top creates a sophisticated overall look, which makes the group great spots for serving food and drinks when entertaining friends, a lamp next to a chair or sofa, or highlighting a decorative items. Coffee Table: 48"W x 24"D x 21"H.
Each End Table: 24"W x 24"D x 25"H.
The Delormy 3-in-1 Pack Contemporary Occasional Tables with 1 Cocktail Table and 2 End Tables by Signature Design by Ashley at Michael's Furniture Warehouse in the San Fernando & Los Angeles area. Product availability may vary. Contact us for the most current availability on this product. Contemporary styling and a rich dark finish make the Delormy collection of occasional tables a stylish choice for decorating your home. The stylish contemporary and durable construction of the cocktail table and end table features framed tray table tops supported by tapered legs with a slight saber leg design. Your home's living room will get a fresh update with the modern style and utility of the Delormy accent table collection. The Delormy collection is a great option if you are looking for Casual furniture in the San Fernando & Los Angeles area. 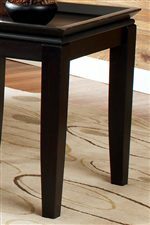 Tray edges, a dark wood finish, and tapered legs create sleek style.